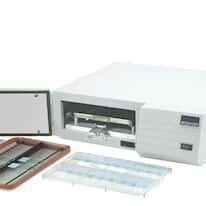 Hybridization incubators, also known as hybridization ovens, are used in life science and research laboratories for applications including nucleic acid hybridizations such as Northern (RNA) blots/hybridizations, Southern (DNA) blots/hybridizations, Western (protein) blots, and molecular biology assays. The blotting protocol is performed in glass hybridization tubes or hybridization bottles held in place by a tube rotator (rotisserie). We offer models with the additional functionality to operate as a shaker or rocker, and even as a UV crosslinker.